What do you do with your broken eggshells? Some people crush them up and feed them back to their chickens, some put them on their compost heap, and some just throw them away without a thought. But one man has done something rather different with his eggshells, in fact, you might call it speggtacular! He has created a sculpture of a chicken! Kyle Bean, Brighton-based designer, has come up with some eggstraordinary works of art over the last few years, including portraits made from pencil shavings, a tube map built of drinking straws and a hand grenade made of jelly. 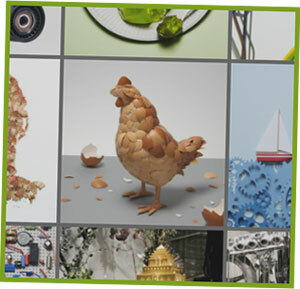 We think the beautiful chicken made from eggshell pieces has to be his finest piece of work yet though. So great, in fact, that it features in a German food themed calendar, alongside other artists and designers. Inspired? We would love to see your eggshell creations. In fact, we might start building something here at Omlet HQ! Mikeshellangelo would have been proud. It seems that Omlet is not only the place to buy an Eglu and other hen keeping accessories, it is also the place to find chicken names! Eglu owner Jennifer Trueland has mentioned us as a great source of chicken names in her comical article ‘On the Naming of Hens’, featured in the Caledonian Mercury. She took inspiration from other Eglu Owners on the Omlet Club, impressed by the originality of some names, including Scaramouche, Princess Layer and Korma (that’s the chickens, not the owners), facing the tough task of naming her own new hens. After much deliberation, Jennifer settled on Muriel, Jane and Agatha, after her favourite authors. Since then the flock has changed and there is now a Tiramisu among the 11 hens… Click here to read more about Jennifer’s chickens, and let us know if your pets have any unusual names! Are you interested in growing your own fruit and veg, making your own cheese or sausages, keeping bees or cooking delicious recipes? Then why not take a peek at the City Cottage magazine!? Written and edited by author and garden eggstraordinare Paul Peacock, this online mag is fascinating and enjoyable for both the complete novice and the more eggsperienced at green living. And the best thing is, unlike other magazines, it’s totally free! Whether you want to get started with keeping a few chickens in your garden, try growing asparagus or learn how to bake a batch of macaroons, you’ll find all the advice you need in City Cottage. It is packed with tips, tricks and brilliant photos that make self-sufficiency a little less daunting. 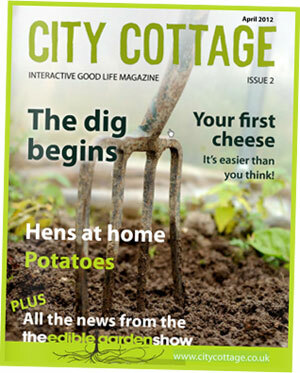 Paul has just published Issue 2 of City Cottage, which you can read by clicking here. Or why not start with Issue 1 and learn how to make your own ketchup!? Paul Peacock’s Magazine is totally free! A couple of months ago we launched a Dog Photo Competition to give you the chance to show off your pretty pooches and hilarious hounds. The response was brilliant and we had a great time looking through your funny and fabulous photos. We enjoyed it so much, in fact, that we thought we’d better do it all again…but this time…for cats! Are you mad about moggies? Then get out the claw trimmers, the grooming brush and the camera and get snapping. Send a photo of your prized pet to stephanie@omlet.co.uk and you could win the following: Verm-X Herbal Crunchies for Cats, Bright Canvas Toy Mice, Anti Ant Stainless Steel Dish, Soft Protection Salon Brush and Feather Fleece Balls. We have three prize bundles to give away to our favourite felines and the competition closes on the 1st of May.